The PFD-12X8-RGBEQ Pathfinder 12x8 RGBHV Matrix Switcher from FSR is a matrix switcher designed for use with RGB video signals. It features (12) inputs and (8) outputs. The system is designed to provide flat signals and adequate bandwidth to all connected components to ensure optimum fidelity. It additionally features cable length equalization to further bolster signal quality. This switcher is well suited for use in video conference rooms, educational facilities, control rooms, monitoring centers, and government institutions, among many other possible applications. The Pathfinder offers split-mode switching technology, which permits each color channel to be independently switched. This feature also allows the switcher to perform the duties of several units and ensures that its switching capabilities will not become obsolete as video types and resolutions are upgraded in the future. Control of the unit can be managed via an ASCII command set that will provide complete access to all functions via compatible control systems. 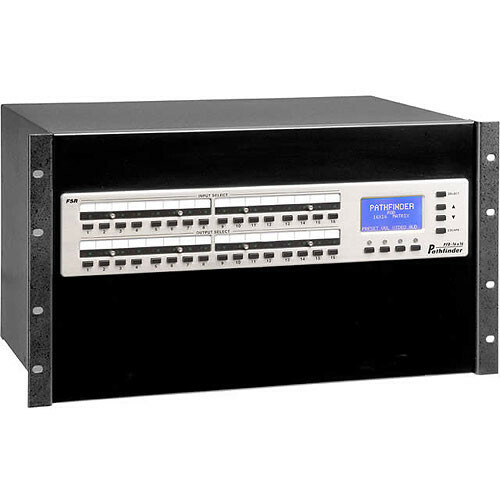 Moreover, the switcher includes both RS-232 and IP control ports. This unit may be used as a standalone device, but has also been designed for placement in a standard 19" rack. Use this switcher to selectively route multiple signals in conference rooms, home theaters, or educational facilities, among many other possible uses. This unit offers high and flat bandwidth capacity to guarantee signal integrity with all connected components. Split-mode switching technology allows the unit to perform the work of several units and ensures future upgradeability. An ASCII command set and both RS-232 and IP ports give you multiple control options.